This is a quick bunch of notes on some herring Glen R. caught at Point Hammond on July 16,2010 and processed for further examination the next day. For background info, please go to Glen riley natural history log or Fish consolidated Waldron for event details. 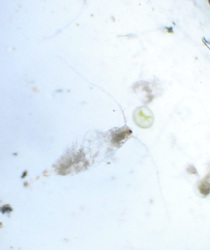 In Glen herring science folder, there are also plankton photos and herring fish photos that are correlated with these notes here. Basically while fishing (7-16-10 pm 6:30-9:00 pm Pt Hammond) for salmon I collected 8 herring, between the sizes 48-64 mm in length. One 64mm herring popped out of the mouth (along with a 54 mm sand lance) of a 10 inch hatchery Coho (successfully released). 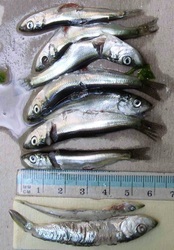 The other 6 herring (48mm 53mm, 54mm, 57 mm, 62 mm, 63 mm, 64 mm ) were snagged on a spoon while I continued fishing for Salmon. 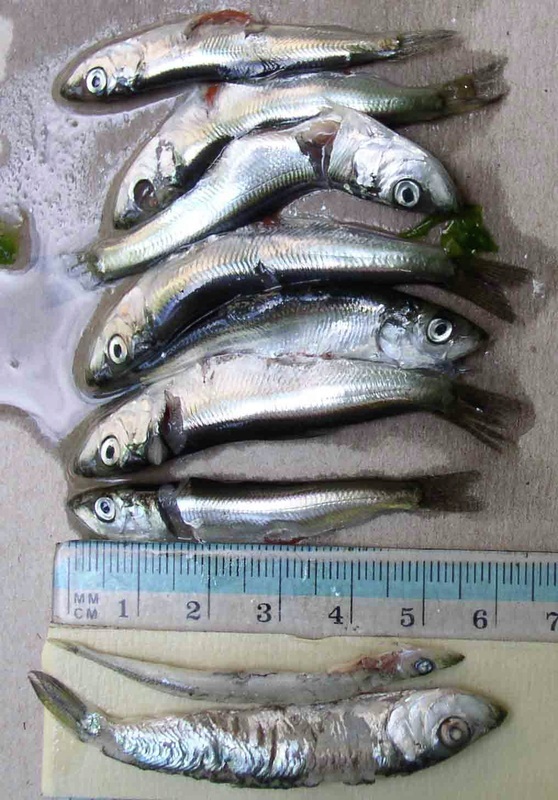 I saved 6 of the herring in sea water overnight (single jar) and the other 1 herring in ethyl alcohol. 2) took DNA caudal fin samples into separate labeled 75% ethyl alcohol vials. 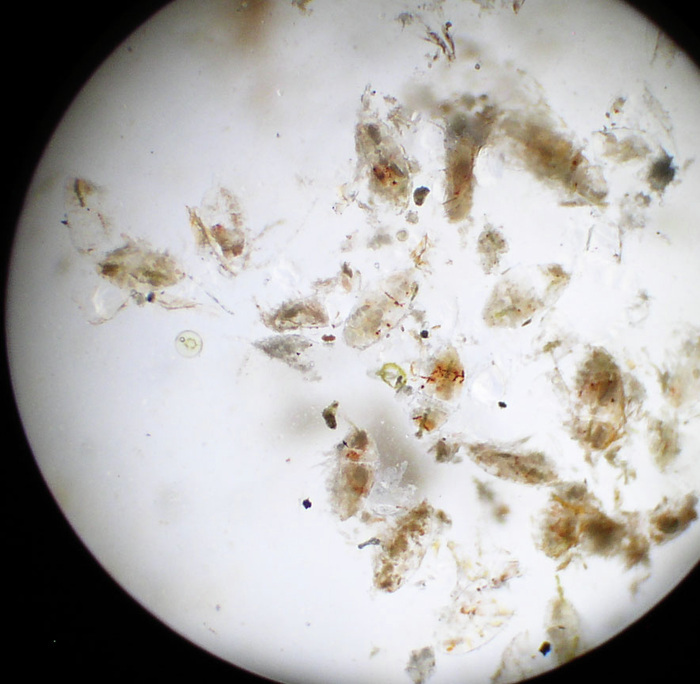 3) cut open all of the herring stomach contents and emptied them into a single petri dish where I viewed them under microscope power from 10 to 40 x. I took pictures of various stomach contents. 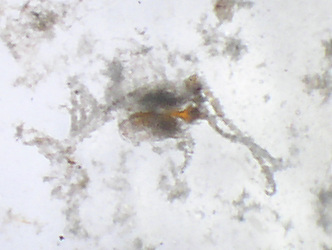 First off, I could only get a clear picture (beyond the ubiquitous circular organisms, see below) of about 5% of the stomach contents. Of the discernable items the dominant contents seemed to be some kind of circular organisms, which I would estimate accounted for 70% of total items . They varied from having a donut hole in the center, to some having internal organs to some fairly undefined. See pics. 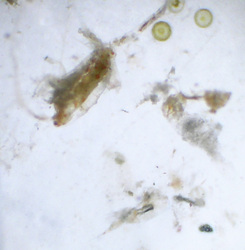 Beyond that, the remainder of the stomach contents appeared to crustaceans of some sort, I would say over 99%. 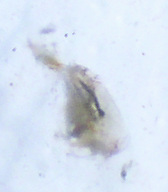 The most common organism I would estimate to be 42% Poecilastomatoids. I venture that I saw about 75 of them. The second most common organism appeared to be harpacticoids at 32% , I saw about 60 of them. 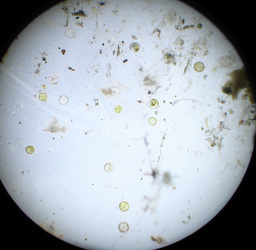 The third most common organism were Calanoids which I estimate about 22%. I saw about 40 of them. 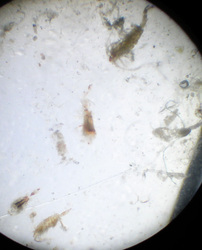 I also saw approx 3 large shrimp/euphasid items. 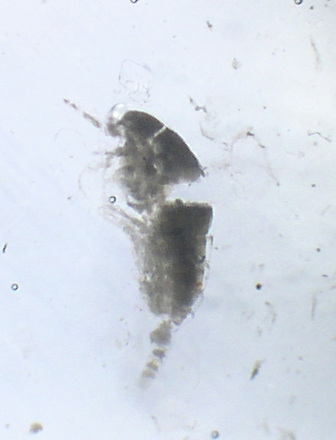 I also saw 1 copepod nauplius, 1 midge fly. No evident fish. 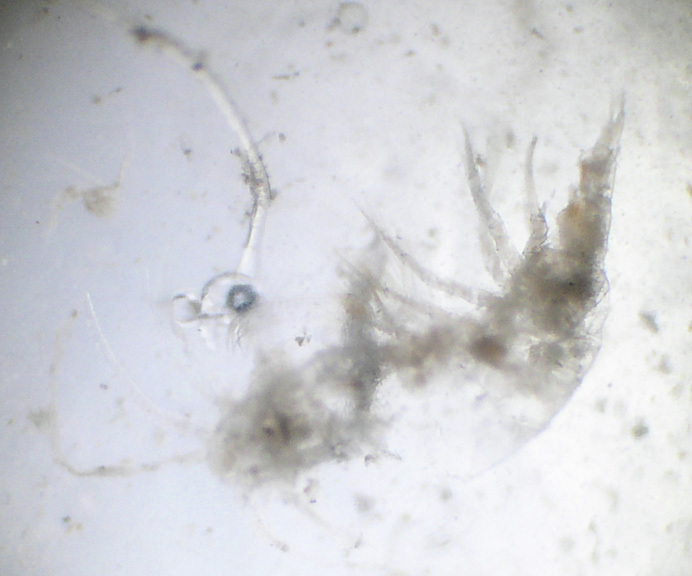 I also saw a live worm, approx the length of a large copepod. I tried taking various pictures but have no pics of it. It kept swimming. 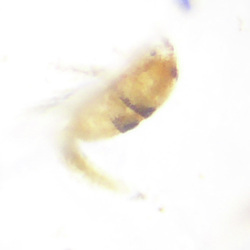 When I downloaded the pics onto my computer, I realized I had no threshold pics to help identify it. 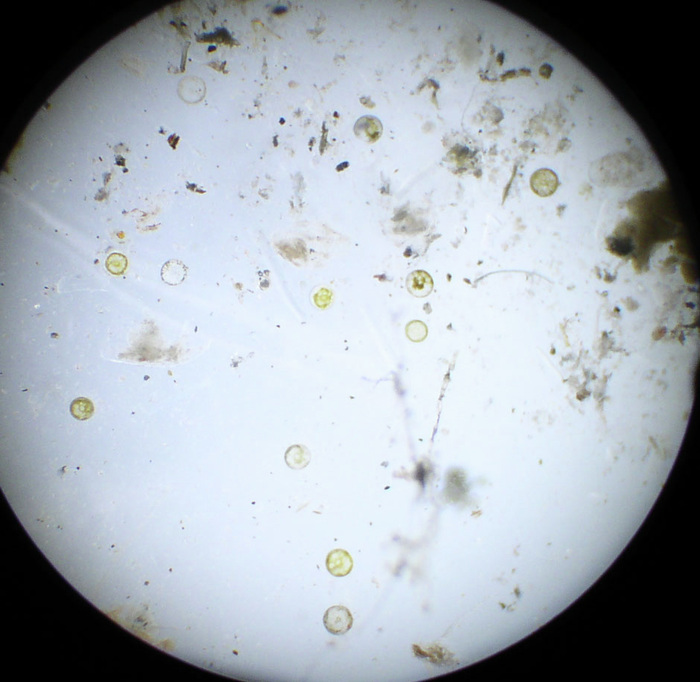 I went back to my petri dishes to find it again but I couldn’t. I think perhaps that it had succumbed to the fresh water with which I had diluted the stomach contents with while washing out the stomach contents container. 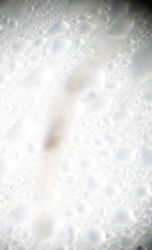 I had the worm in a specific petri dish compartment but couldn’t find it again. 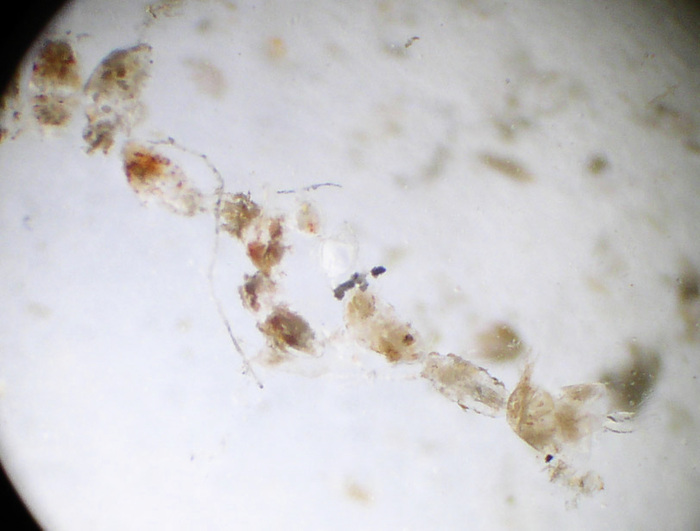 With all of the debris in there, I think it may have died either from the water change or to the heat of the microscope light changing the water temp. 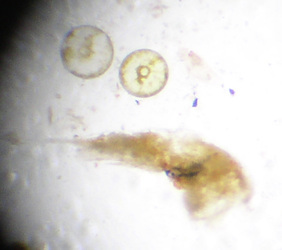 approx 3 shrimp or euphasid type larvae.